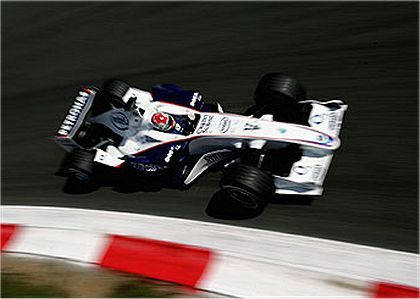 One item of news in the last week that was hardly noticed but actually has considerable importance was the announcement by BMW Sauber that their challenger for 2008 will be revealed on January 14th and 15th. The significance of BMW being the first to announce a launch date is that they are close enough to finishing the car to know when it will be ready. This harks back to the team's statement that they were no longer developing this year's car and were concentrating on next year's instead. With their second place in the manufacturer's competition (alhough Mario Theissen considers that they are third, regardless of any decisions made in Paris) already unassailable it makes sense for them to switch their efforts to the future. Renault are in a similar position, with little left to play for this year and they, too, are now directing their efforts entirely towards 2008. The two top teams, McLaren and Ferrari, can afford no such relaxation from the battle, as both are still in with the chance of the driver's title this year. And this might just turn out to be a turning point in both their fortunes. It is an old adage that the team that is most ready for a new season is the one most likely to win races. It is rare that a team starting off behind schedule ever manages to catch up with the pace of development in F1 throughout the year; Red Bull, Honda, Renault and others have found it impossible to recover from poor beginnings to the 2007 season and those in the same position next year are likely to suffer in the same way. What it means is that BMW and Renault will have a slight lead in development of their new designs over the winter and, if everything remains on schedule, they have a good chance of having their cars ready and raring to go when the new season commences. Ferrari and McLaren, however, are going to have to squeeze an equal amount of development into less available time if they are going to be as thoroughly prepared as the competition. And this gives BMW and perhaps Renault hope of being one of the front-running teams in 2008. If they can get the design right and use their extra time wisely, they could leap the gap to the top and start winning races. Of course, much depends on that small matter of getting the design right but, considering how the BMW in particular has steadily improved over the last couple of years and how they have proved that they can keep up with the pace of development, it is quite likely that their car is going to be hard to beat in 2008. There are other factors as well that indicate that the status quo at the top of F1 is about to change. Ferrari have increasingly appeared in disarray as this season has progressed, the tire debacle in Fuji merely the latest and most glaring of the errors they have made as a team. It is hard not to blame this on the personnel changes made over the last off season and, if that is true, things will only get worse in the future. I suspect that Ferrari is returning to its traditional state of chaos and their days at the front are numbered as a result. McLaren is also likely to suffer from the huge disruptions and strains this year has heaped upon them. They have the worry of the FIA inspection of their new car to think about (and who knows what that unpredictable oganization will decide?) and the strong likelihood that one of their drivers will depart, leaving a gap that will not be easy to fill. Lewis Hamilton may be the greatest thing since sliced bread, but rumor has it that he does not have the experience yet to be much help in setting up the car. So the team will need someone with experience to drive the second car and help in its development. It remains to be seen who that will be. On top of all that, it looks as if McLaren will be taking on the production of Prodrive's contender as well as their own. Although they are confident of having the capacity to do this, it is inevitable that it will introduce unexpected strains upon a workforce used to producing far fewer versions of their car. It begins to add up to quite a difficult year for McLaren, and that is presuming they get the design right in the first place. My expectation is that next year will be a lttle different from 2007 therefore. BMW have an excellent chance of breaking through into the lead and this gives their drivers, Heidfeld and Kubica, a chance to really show us what they can do. Renault should be in there punching as well and Williams look rather pleased with what they have lined up for 2008. I would not be surprised if Red Bull make considerable progress over the winter too, although the other teams seem less convincing somehow. If Lewis Hamilton wins his championship this year, I do not think he will have an easy defense of it in 2008. Things are shaping up in such a way that he will really have to prove his worth when his car is not necessarily the best on the grid. It seems to me that next year could turn out to be a classic - provided we get no more political nonsense to interfere with it! What interest me about next year is how fast McLaren are going to be. There was an interview with Pat Symonds from Renault somewhere (may have been the ever reliable F1 Racing...), and he stated that apparently although McLaren were very quick this year they didn't fully understand the reasons behind it - if that is true then it may be that they struggle to evolve the design from this year, keeping in the good bits and getting rid of the bad bits. BMW have been very impressive in their development as a team so far, and I would be happy if that continued into next season as well. They have taken a relatively big gamble by buying their own team outright, and trying to integrate the best from their own workers and also from Sauber, so good luck to them. I think that is quite often the case, Craig - that a team don't fully understand what makes their car that little bit quicker than anyone else's. Consider how Chapman fell flat on his face with the follow-up to the Lotus 79, while Williams and Brabham made full use of his invention with championship-winning cars. I think McLaren will always be somewhere near the front as they have such a strong team, but next year they may well be struggling to keep their advantage. And I would love to see BMW hit the front and break the stranglehold of the top teams! Renault having an advantage in car development: seems like a perfect reason for Alonso to make the switch. It seems to me that last year McLaren were pretty quick, just not very reliable, did they ever fix that issue! Not one engine failure this year, and Alonso's crash seems due to driver error or a previous encounter with Vettel. They should be pretty fast next year. Other then the TC ban theres nothing that would drastically change the design of the car. As with you, Clive, my money is on the Germans next year but the Alonso Renault pairing could shine through again. Most people reckon the improvement in McLaren's engine reliability has been due to the FIA's engine freeze and the drop to 19,000 rpm. That could be so - if you're struggling to get an engine to last at 20,000, to limit it to 19,000 could be just what was needed. But the same applies to all the engines, I would have thought. Renault could well be back at the top, now they understand better what went wrong last year and, as you say, with Alonso in the car they have to be possibles. But I just like that Beemer. Go Nick! McLaren and Ferrari have had an interesting season off the track to say the least. With both teams being in the constructors championship race, its safe to say that neither has been attentive to the 2008 design for their cars. Remember that Renault fell victim to this attitude just last year. This is not a bad thing, it is probably human nature. The problem with this thinking is that when a team discovers this it is too late. BMW announces that it will release it's car this January. It is my guess that BMW and Renault began to work on the car for 2008 after Spain. This gives both team a significant advantage. There are only 24 hours in a day so any time you can begin early you have an advantage. Another reason why BMW may be better are the driver. Both have many years experience and both know how to contribute to set up of their cars. This year we saw that Hamilton was not so experieced. He admitted at Fuji that he "went astray" from the set up that Alonso was using and try to go out on his own. He did not do so good in both of those races. Renault will have an advantage especially if the reaquire Alonso. In developing a new design having an experieced driver is such an added bonus. I can not wait to see what the Germans have for us. Yup, it looks like being a very interesting season, John (for the right reasons this time, I hope). It will be so good to have some variety on the podium, rather than the same old faces. We've had a few problems with the code number, Milos, but I thought they were all fixed now. Thanks for pointing it out. One thing I have done when the code causes problems is hit the back button on the browser to return to my comment, then copy it to the pasteboard and go back to the main blog. Then I can re-enter the comments system, type in the new number and the details and paste in my comment. That has worked for me every time I've had problems. Sorry it's such a pain at times but we'll get all the bugs sorted out eventually, I'm sure! Having your engine forced to top out at 19K may help with reliability a little bit, but it also means you must build an engine with a good torque/power graph meant to top at 19K and an engine well suited to making good power between 18-19K. I'm sure the F1 teams knew this when the freeze was announced, but how well implemented is it? Any answers from the customer teams? They're the ones that are most likely to talk/complain about problems. That's a very good point, Chunter - the engine freeze looks as though it will save money but it ignores the fact that the engine manufacturers still have to re-design the engine to suit the new limits. But, as for it being well implemented or not, in F1 it's "get it right or die". And, judging by the reliability record of all engines this year, just about everyone got it right. There have been a few problems with gearboxes but not many with engines. As for the customer teams, I haven't seen any complaints from them. They seem pretty satisfied, in fact. Another reason to favor BMW is there computer system. Computational Fluid Dynamics should take some of the black magic out of the aero design of the car. Being that this is the fastest of any team, and will have the extra time to process this information should prove extremely beneficial. PS: I tend to have a hard time with the code number after a long post, it must reset change after so many minutes. If you attempt to post just make sure it actually posted, if not just re enter the new code. Maybe there is a refresh function that can be adjusted to keep the same code for maybe 10 min instead of 5? That is where our problems with the comments system have originated, Dan. There is a time limit on the code after which it expects to be refreshed. We've tried again and again to extend this time limit (I quite often get caught out by it because I tend to write a lot) but it's very obstinate and seems to reset itself back to the original limit after a while. Sooner or later we'll nail the blighter down! I hope so, Alex - I would really like to see some change amongst the front runners next year.